Buy 100 % pure n-Octyl Chloride from us at competitive prices. We are one of the leading Manufacturers and Suppliers of n-Octyl Chloride in India. It is a highly effective component used for making varied products. We make it using superior-grade raw materials and advanced technologies. Buyers can obtain n-Octyl Chloride from us at competitive prices as per requirement. General Description : n-Octyl Chloride (also called 1-Chlorooctane) is a clear, colorless , flammable liquid belonging to the family of organic halogen compounds. It is hard to dissolve in water, but can be mixed with alcohol and ether. 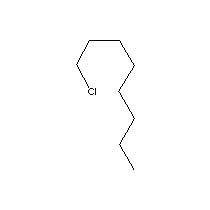 This chemical is on the special health hazard substance list because it is flammable and gives off irritating or toxic fumes (or gases) in a fire. It is used as a solvent, as a medicine to control worms, for organometallic compound synthesis and to make other chemicals. Stability Stable in ordinary conditions in sealed containers. Applications : n-Octyl Chloride is used as an alkylating agent in organosynthesis, organometallic compounds manufacturing and as a solvent.